As the first international lighting fair in Central America and the Carribean Region, Interlumi Panama 2016 witnessed a complete success, receiving over 120 lighting brands from 18 countries/regions and almost 2,000 visitors from 27 countries. The exhibitors praised the professionalism of InterLumi Panama and its high quality visitors. 87% of them showed interest in participating in the Interlumi 2017 edition as well. Visitors, on it’s turn, were impressed by a wide variety of lighting products on site. The next edition, Interlumi 2017, will keep up with the trend of the global Lighting industry. Aiming to become an international platform for exibitors, Inter-Lumi Panama 2017 would like to involve more participants from all over the world to light up the path to the Latin American & Carribean market. 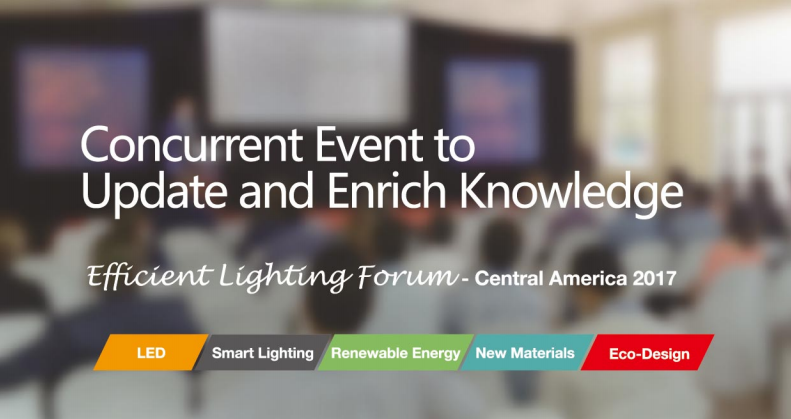 In addition to hosting a variety of exhibitors and products on display, the show also holds a concurrent event to help participants enrich their knowledge and add value to their visits: The Efficient Lighting Forum. Debuted alongside the first InterLumi, the forum ushered the audience into the amazing world of the lighting industry. 10 professional speakers were invited to share ideas and expertise, providing an informative platform for the participants to learn more about the practical experience as well as the application of state-of-the-art technologies in the market. Amid applause and high recognition, the forum in 2017 will further in-depth communication to inspire the region’s lighting practitioners to discover the prospect of efficient lighting in the LATAM area. With simultaneous interpretation provided, topics featuring LED lighting, smart lighting, renewable energy, novel materials and eco-friendly lighting design will be discussed without any language barrier. Visit the official event website at http://www.inter-lumi.com. InterLumi Panama, the global lighting trade show organized by America Expo Group, is running on an annual basis at the ATLAPA Convention Center in Panama. Serving the Latin American & the Caribbean countries, InterLumi Panama is positioned to be an effective tool to stimulate the development of the region’s lighting industry as well as provide a gateway for exhibitors to tap into this emerging market.